Once you arrive in Sri Lanka, you will be greeted and welcomed by our airport representative, who will introduce you to your chauffeur. You will be transferred to Colombo the commercial capital of Sri Lanka. Once you check in at your hotel, relax and spend the rest of the day at leisure. During the evening if time permits, we may take you on a tour around Colombo. Overnight Stay : Hotel in Colombo. After breakfast leave for Kandy. En-route visit the Kurulukele Bird Sanctuary in Kegalle. (81 km, approx. 2 hour drive). The Kurulukele forest is a significant area for bird watching with plenty of native and migrant bird species. Possible noteworthy species: Ceylon Spur fowl, Ceylon Green Pigeon, Yellow-Fronted Barbet, Black-Capped Bulbul, Ceylon Hanging Parakeet, and more. Thereafter leave for Kandy. 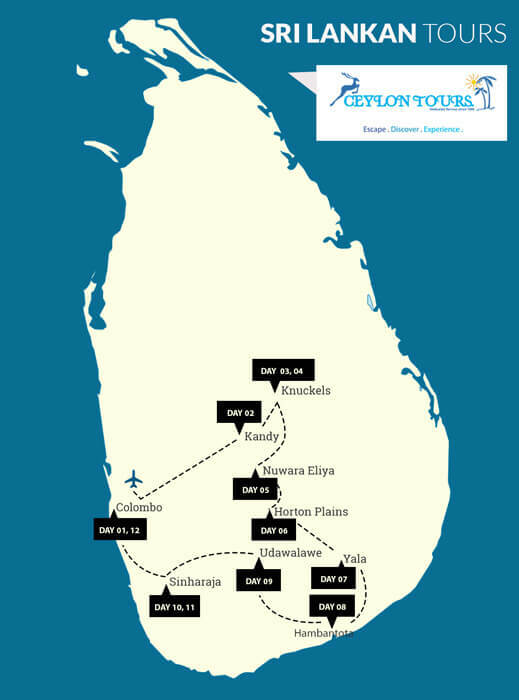 En route you will visit a spice garden in Matale. You will check in at your hotel on arrival and once you are rested, continue on to your tour of Kandy. Kandy, the bustling hill country capital is now a UNESCO World Heritage Site. The sacred ground of the city also home the much venerated tooth relic of Lord Buddha, in the Temple of the tooth relic which is a focal point for Buddhist veneration. Apart from that the city still projects an aura of royal beauty, echoing the grandeur of Sri Lanka’s last royal kingdom through iconic features such as; the Kandy Lake (built in 1807) and the Peradeniya Botanical Gardens. The city tour entails a visit to the above mentioned temple of the tooth relic and captivating cultural show at the Kandyan Arts & Cultural Centre. Overnight Stay : Hotel in Kandy. After breakfast leave for Udawattakele. This historic Forest reserve and sanctuary is situated north of the temple of the tooth in Kandy. It is about 257 acres in area and is home to many species of birds. The birds seen most often within the sanctuary include the Sri Lanka Yellow-fronted Barbet (Megalaima Flavirons), Sri Lanka Layard's Parakeet (psittaculacaltropae), Sri Lanka Spurfowl, Sri Lanka Spot-Winged thrush among a number of others. Later head for the Knuckles and check in at your hotel on arrival. If you have spare time continue your day of bird watching at the Knuckles forest range. The Knuckles mountain range exists as a unique ecosystem separate from the rest of the central hills, and offers a wonderful opportunity for Bird watching, Trekking, and Photography. After breakfast head to the Knuckles Forest reserve for a day of bird watching through the nature trail in the forest. Over 120 bird species are recorded here. Among them fifteen are endemic to Sri Lanka such as Jungle fowl, Yellow-fronted Barbet, Small Barbet, Sri Lanka White-eye, Black headed Bulbul, Yellow eared Bulbul, Dusk blue Flycatcher, Brown capped Babbler, Sri Lankan Grackle, Sri Lankan Lorikeet, Sri Lankan Warbler, White faced Starling, Spot Wing Thrush, Sri Lankan blue Magpie and Layard’s Parakeet. Overnight Stay : Hotel in Knuckles. After breakfast leave for the heart of Tea Country, Nuwara Eliya. The misty city is located over 6000 feet above sea level. The drive will be through refreshing Tea Plantations covering the hills like carpets and cascading waterfalls to mesmerize you. Victoria Park in NuwaraEliya is popular with birdwatchers at quieter times because of the good opportunities it provides to see a variety of species, particularly the Indian Blue Robin, Pied Thrush or Scaly Thrush lurking in the denser undergrowth. The Kashmir Fly catcher is another attractive bird species found in the park. Overnight Stay : Hotel in Nuwara Eliya. After an early breakfast, we will leave for Horton Plains- the highest plateau in the country, which is one of the very important National parks in Sri Lanka known for its topographical variations. It has unique vegetation and is famous for many rare and endemic highland birds. The most overwhelming physical feature of the Horton Plains is the escarpment that falls 880 meters to the lowlands of the southern region of the island. Aptly known as the ‘World’s End’ the view from the precipice of the countryside below towards the south coast is spectacular. Dawn or early morning is the best time for observing it. Horton’s plain National Park harbours 12 species of endemic birds. The following birds are recorded only at Horton Plains, the Sri Lankan Blue Magpie, Dusky Blue Fly Catcher and Sri Lanka Wood pigeon. Enjoy the day trekking through the Horton plains and head back to your hotel in Nuwara Eliya on completion. On arrival in Yala, check in at the hotel. In the afternoon commence a jeep safari in the Yala National Park by private jeep accompanied by a tracker. Yala National park is one of Sri Lanka's premier eco tourist Destinations and is renowned for its variety of wildlife notably its many elephants. It is also home to the spotted deer, sambar, wild buffalo, sloth bear, jackal, mongoose and crocodiles. The peacock is easily the most famous of the birds in this park. Yala has a high concentration of Leopards although seeing these nocturnal carnivores still requires some luck. Overnight Stay : Hotel in Yala. Rise early and leave for the beautifully diverse landscape that comprises the ecologically rich rural destinations of Rekawa, Ussangoda and Kalametiya aslo known as the RUK area. Located in the Deep South, the area contains many ecologically important terrestrial and wetland habitats. The Kalametiya bird sanctuary is one of Sri Lanka’s oldest sanctuaries and is a bird watchers dream come true. In the evening leave for Bundala National Park and view the visitor centre. Head for your hotel in Hambantota and check in. In the evening leave for Bundala National Park that is home to 107 species of birds and is an internationally important wintering ground for migratory water birds in Sri Lanka. Overnight Stay : Hotel in Hambantota. UDAWALAWE NATIONAL PARK lies south of the central hills in the island's dry zone. An important eco-tourism destination, the Park consists of dry lowland forest, riverine forest, thorny scrublands and grasslands. One special attraction of the park is the Udawalawe reservoir and the Walawe River which flows through the park. It is most famous for the many elephants that live in the park. This fascinating park is also a great location for bird enthusiasts. The avifauna in the park includes a large number of Warblers (Prinia ssp) together with the usual low-country birds in forested areas, and a variety of Raptors. Afterwards leave for Ratnapura. Commence a sightseeing tour of the city. Ratnapura is the world’s richest treasure house of gems. Rare sparkling precious and semi-precious stones are found in the rich soil that covers the entire district. A visit to this city of gems is a must for any visitor. It is a city set amidst a mix of paddy fields, rubber and tea plantations which give a scenic backdrop to this legendary city of a thousand gems. Overnight Stay : Hotel in Ratnapura. After breakfast leave for Sinharaja Forest Reserve. It is the least disturbed and biologically unique lowland rain forest remaining in Sri Lanka. It is a treasure trove of endemic species including trees, insects, amphibians, reptiles, birds and mammals. Because of the dense vegetation wildlife is not as easily seen as at dry zone national parks as Yala. Bird watching is particularly interesting as it is home to 95% of the endemic birds of Sri Lanka. After breakfast leave for Sinharaja Nature Reserve for birding. One of the major features at Sinharaja is the presence of bird "Feeding Flocks". These flocks give life to the forest which under normal conditions is silent and uneventful. It is also the highlight of bird watching in the forest. There are endemic birds to be seen in Sinharaja. They are Red-faced Malkoha, the Sri Lanka blue Magpie, the Ashy-headed Babbler, the White-headed Starling and the Green-billed Coucal the rarest of Sri Lankan birds. After breakfast leave for Colombo the commercial capital of the country. Check in at your hotel on arrival. In your spare time, drive through the vibrant city and enjoy the wonderful fusion of 16th century grand colonial buildings and modern office structures. Experience the chaos in the vibrant markets and bazaars of Pettah, and be blown away by the depth of our Sri Lankan history at the National Museum with its fine collection of lovely antiques and art. You could visit a Buddhist temple and a Hindu Kovil to experience the diversity of religion, ethnicity and customs of the people. Alternatively you may indulge in some shopping. As all good things must come to an end, after breakfast your chauffeur guide will comfortably take you to the international airport in time for your return flight. We hope your adventure with us was enjoyable and wish you a safe and pleasant flight home!